There are so many reasons why I walk. I walk for my daughter who valiantly struggles daily with her bi-polar disorder. I walk for my granddaughter who is just discovering the impact her own illness will have on her life, while she struggles to be a teenager, deal with her mother’s illness and move forward into that life. I walk for that young man in the waiting room with the fear in his eyes. He doesn’t understand what’s happening to him, and he can’t make it stop. I walk for the man standing in line waiting. I can’t tell how old he is through all the tangles of hair, layers of clothes and dirt. I wonder what he would look like underneath it all. I walk because so many people do not to see them at all or if they do, look away. 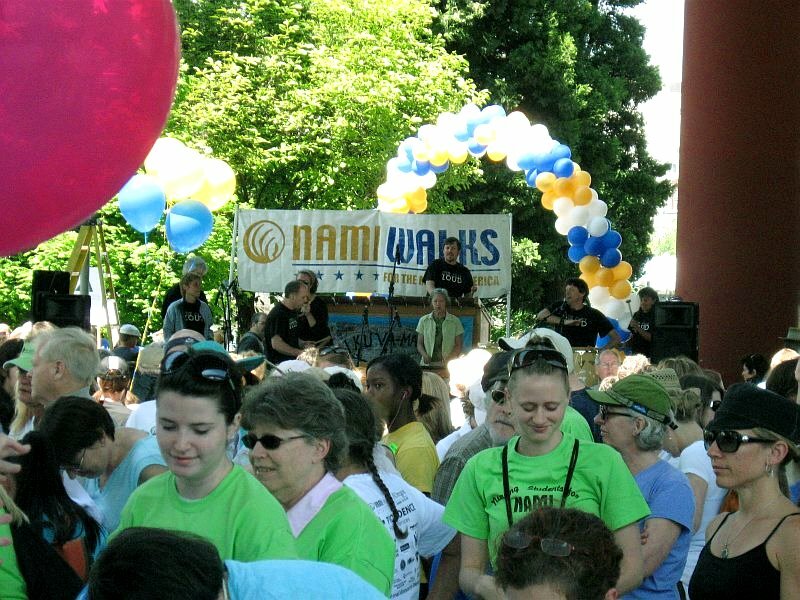 I walk for the psychiatric provider that is looking for ways to help her indigent clients remain on their medications and continue to get the care they need. I walk because I have to; all these people need to know that there is someone who cares. Please be a part of that number, support NAMI and help change the future for the people I walk for. I walk because we all know family members or friends who suffer from mental illness. There’s nothing they did or didn’t do to have this disease. It could have easily been one of us. We’e’re all just a heartbeat away from it. I will walk in memory of my son Greg who I lost on April 16th. Greg would have been 21 years old in June. Although many people knew of Greg’s substance abuse, few knew that Greg was diagnosed at age 6 with the neurodevelopmental disorder Tourette’s Syndrome then, in his late teens, with “Mood Disorder, unspecified.” There is a reason for this: there is more understanding and less stigma attached to substance abuse than to Tourette’s and mental illness in our society. My son suffered so much in this life… I always wanted people to be open to what a sensitive, wonderfully unique person Greg was and realized early on that diagnostic labels close minds. My son Greg had moments of sheer joy in this life, but days and months and years of sheer mental pain from which he could not escape. My walk will be for Greg and for all those who who suffer the pain and the stigma of mental illness.